6 crystal bud vases from 2.5 - 6" Diam. 1 silver tray 12.25 inches Diam. In this post, you will see how you can make a fun and easy arrangement that has a little sparkle with several small crystal vases and assorted flowers from the garden. Get creative. Two of the arrangements pictured above that have spherical blooms in them, are onion tops from the garden. One has a bright pink geranium. The micro vase has fuschia Vinca ground cover in it. Two of the crystal micro vases showcase yellow roses. See, you don't even have to go to the store to create a beautiful arrangement. 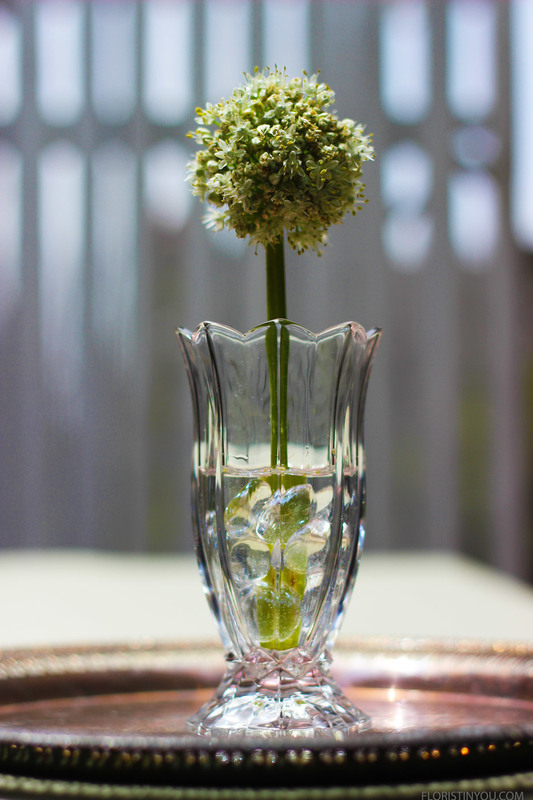 Get out one of Grandma's old silver trays and you can make a grouping of all sizes of crystal vases and blooms, or for a dinner party you can have one micro vase or bud vase with a flower next to each place setting. I used clear flat marbles to hold the stems upright in the vases. The marbles hold them straight and because they are clear, you really don't notice the marbles. Well, rummage through your cupboards and through the china cabinet, or take a girl friend to some second hand stores to look for tiny crystal vases. I always keep my eyes open for them whenever I go. You never know what you will find on a treasure hunt, But 'Bingo!' Sooner or later it will be your lucky day and you will come across some. If you have your flowers from the garden, your vases, and marbles, let's begin. Put bottom of sphere 1 inch from top of vase. Notice the tiny flowers on the onion top. Place a geranium stem with the bottom of the bloom 1" above the top of the vase. Put a medium sized bloom in a 3 inch high bud vase. This one is a rose. Put a small bloom in a 2.5 inch micro crystal vase. This is a small rose. These dainty little flowers are Vinca, groundcover in a 2.5 inch micro vase. Have some variations in the height of the vases and blooms, as well as repetition of bloom types and colors. Put them on a silver tray and you are done. Have a fun dinner party.